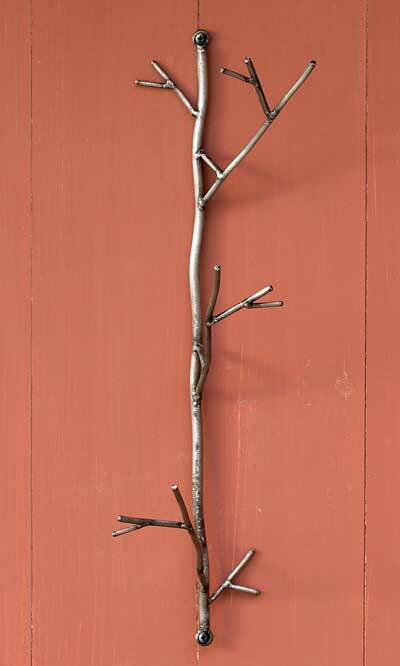 Adorn your wall with a beautiful, nature-inspired hanger using this Ancient Graffiti Gray Triple Twig Hanging Hook. Placing this unit on your wall not only offers hanging spots for three small items; it also celebrates trees in a fun new way. A 19.25" tall shaft attaches to your wall easily, thanks to open loops at the top and base and included screws. Three arms extend upward and outward, creating hanging spots for light items, and their slightly curved shape enhances the twig-like feel. Additional, short extensions against the wall further the motif, and the gray color of the piece offers a timeless look. The metal construction forms a durable hanger, perfect for use in your entryway or on a garden wall. Add striking hangers to your wall easily with this Gray Triple Twig Hanging Hook.